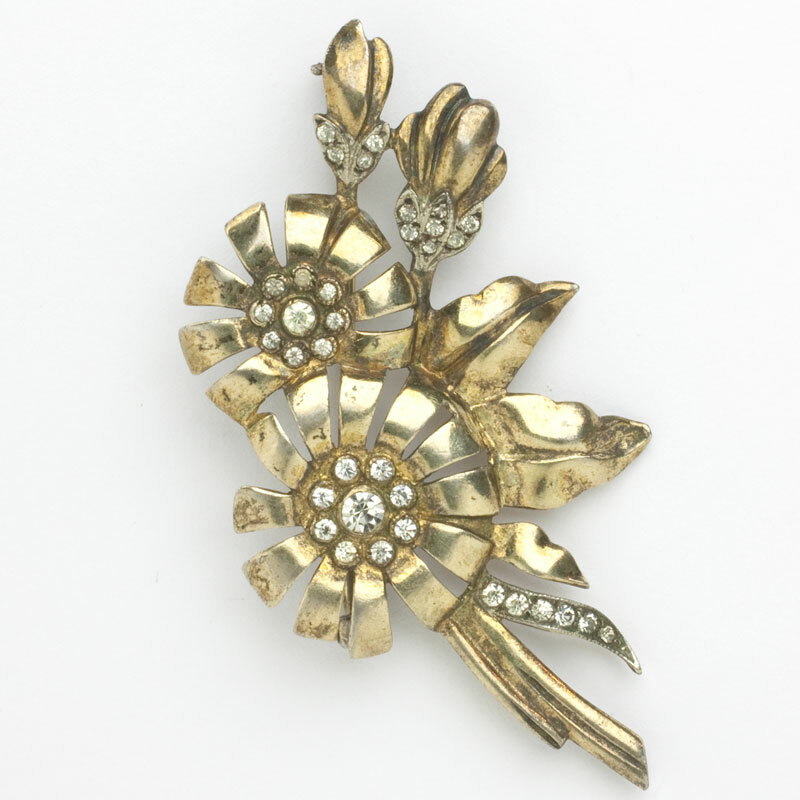 This mid-1930s Art Deco pin is a variation on the era’s bar brooch. 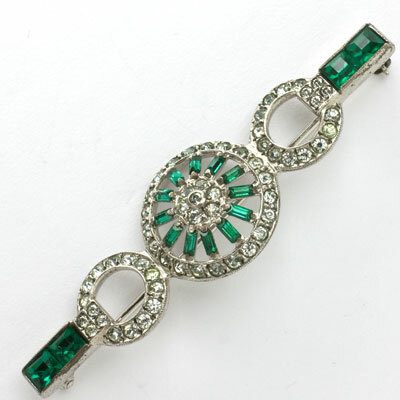 It features two faceted, square-cut emerald-glass stones at each end. 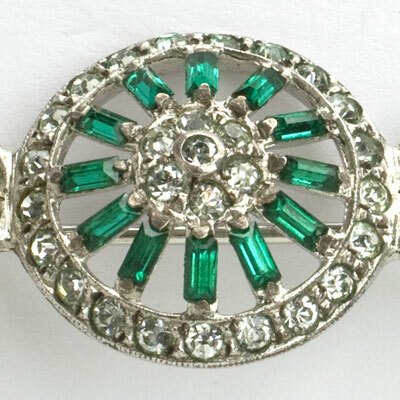 The centerpiece is a diamanté-encrusted circle in a starburst pattern with emerald stones emanating from the pavé center. On each side is a smaller diamanté-encrusted cut-out circle. 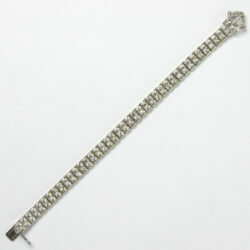 The setting is rhodium-plated sterling silver with a roll-over safety clasp. A well-executed, intricate design. 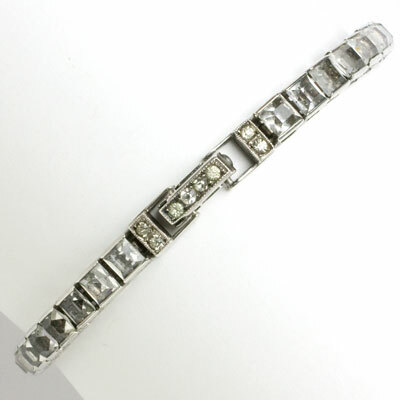 Wear this lovely piece with your own diamond stud earrings (faux or real) and an emerald and diamanté filigree bracelet – scroll down to see it. 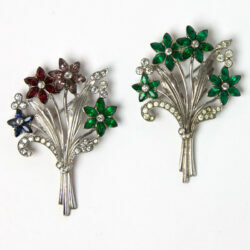 These flower bouquet brooches from the 1940s have deep-colored-glass petals with diamanté centers and accents. The stems and settings are sterling silver. 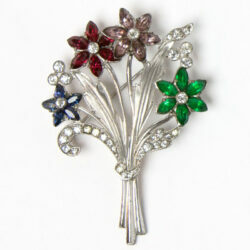 The brooch on the left features sapphire, ruby, amethyst, and emerald glass flowers; the one on the right is all emerald. Delicate and well-made by Otis, these brooches can be worn separately (e.g., on either side of a collar) or as a pair with great effect. 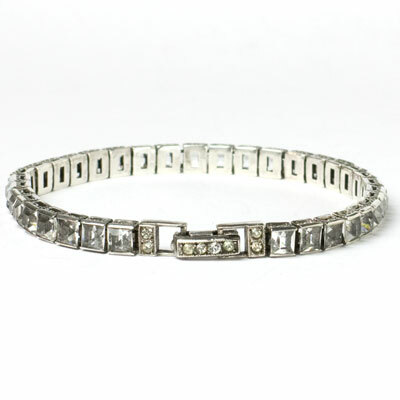 These pieces were advertised in the 1949 catalog of George T. Brodnax Jewelry Co., a mail-order company located in Memphis, Tennessee. 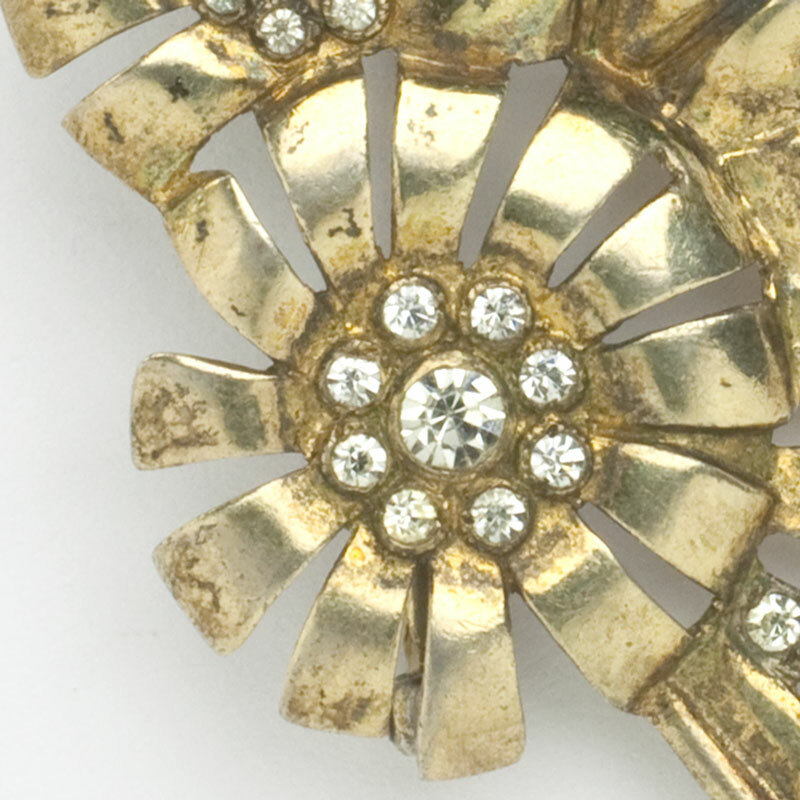 This gold-plated flower brooch is the only Otis piece I and my friend and co-author Robin Deutsch have ever seen with this finish. 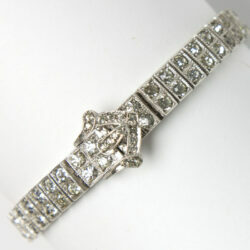 Though petite, this graceful sterling silver brooch with diamanté is charming. The finish has a few dark spots, but overall it looks much better with the naked eye than my camera indicates. You can read our Otis article here.